Hope you’ve got an appetite as today new info was released about Star Wars Galaxy’s Edge including the ability to drink the famous blue milk from the films. Barrons wrote an extensive piece outlining some of the incredible details that are being added to Star Wars Galaxy’s Edge and they have me really excited (as if my expectation level wasn’t already through the roof). 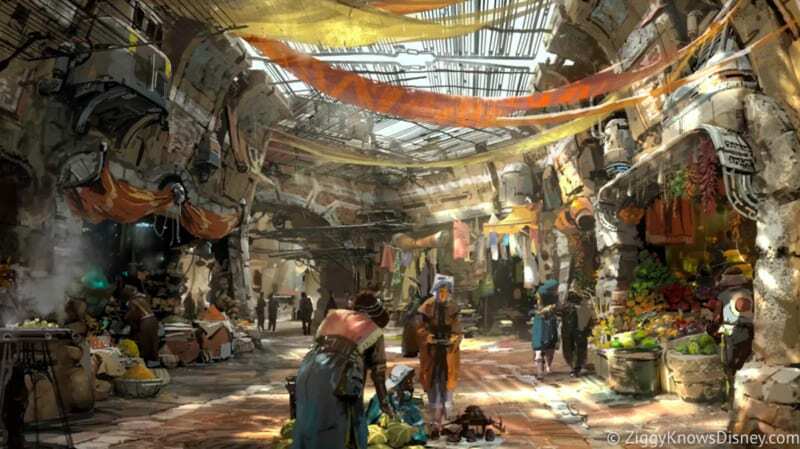 Besides the blue milk you’ll be able to drink, they gave more details about Black Spire Outpost, which is the shopping and restaurant center of Galaxy’s Edge and the fact that you’ll even be able to haggle with animatronic merchants. Oga’s Cantina, which is going to be one of the two restaurants in Galaxy’s Edge, sounds like it’s going to be a really amazing experience and we now know a bit more of what to expect there. The biggest detail is that guests are going to stand in Oga’s for the most part, and while there will be some booths, sit-down tables will be very limited. The reason for this is Disney knows that Galaxy’s Edge is going to be packed with people, and they want to keep people moving through the restaurants. 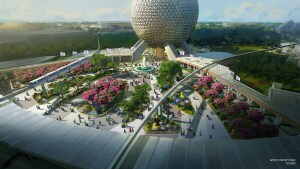 Disney is still deciding how reservations for the tables will be given to guests, maybe it could be connected to credits you win in the land’s two attractions. The bar area sounds amazing and is described as “an intricate tangle of tubes and vessels behind the bar might make some drinks appear to flow from the ceiling.” Nothing has been decided yet about the menu, but it’s going to be an incredibly busy locale. 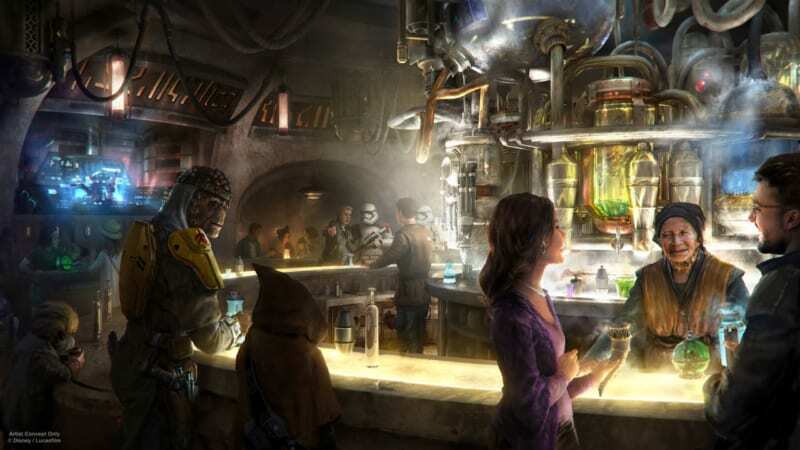 The two restaurants in Galaxy’s Edge are going to serve alcohol, which of course will be a first to Disneyland guests outside of Club 33 which is not open to the public. The blue milk, the famous drink from Star Wars: A New Hope, will be a non-dairy drink strangely enough. No details have been given on where it will be sold, but it might be a combination of Oga’s Cantina, the Black Spire Outpost Marketplace or both. One interesting detail about the restaurants and food in general in Galaxy’s Edge is that it will all be supplied from one common kitchen. This is a smart idea and will improve on the efficiency of service which will be key to wait on the mass number of people coming here. It also makes sense as there are a lot of building in Black Spire Outpost and it’s a smart idea to make one centrally located kitchen with easy access to the surrounding restaurants. We also got some new info about the shops in Black Spire Outpost. 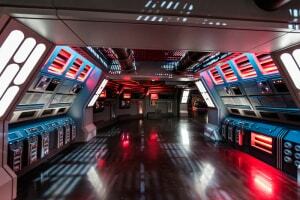 One shop will have droids that visitors can customize and take home through an interactive experience. These droids will interact with their environment in Galaxy’s Edge and can warn of incoming stormtroopers or other surrounding characters or land features. This will be great for making your experience in Galaxy’s Edge different every time. If you want to take home a full-sized R2-D2 or like-droid, that might be possible too! No prices have been set for any of the droids, but expect the big ones to cost even in the thousands of dollars! Another shop will be run by Dok-Ondar, a collector who we hear mentioned briefly in Solo. It’s rumored that he is going to be an animatronic figure. Cast Members will be able to interact with Dok-Ondar, asking him what he thinks of the prices guests are offering, resembling an outdoor bazaar you might find in a Middle-Eastern marketplace. Star Wars merchandise in shops will come in unique packaging that downplays the logos and merchandise based on familiar characters will take on new looks. There will even be a pod-racing engine, perhaps at the market, which will be used to roast meat. Disney has taken some flak for going a bit cheap on Toy Story Land in 2018, but it seems they going all-out for Galaxy’s Edge and will be taking story-telling to an entirely new level unlike anything theme park-goers have ever seen! 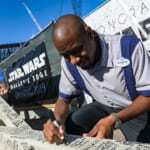 Disney Imagineers and Luscasfilm has been collaborating on the project together to give Galaxy’s Edge the most real and authentic feel possible with Imagineers visited the archives at Lucasfilm for early concept art. 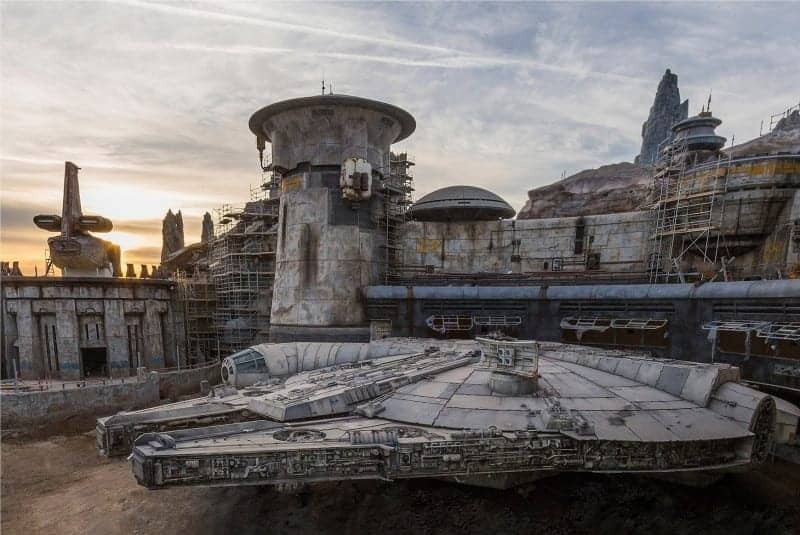 No new info about the attractions this time, but we did just get that special behind-the-scenes look at Star Wars Galaxy’s Edge over Christmas during the Disney TV special. They showed new video from Millennium Falcon: Smuggler’s Run and Star Wars: Rise of the Resistance, which both look even better than expected! 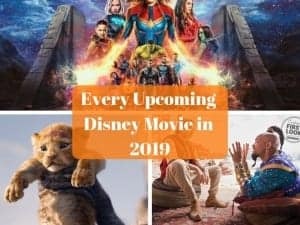 These last couple days have been exciting for Galaxy’s Edge news as Bob Iger announced yesterday that Galaxy’s Edge in Disneyland will be opening in June 2019, and we even have an idea of which weekend it’s going to be. Then we also got a look at the ride vehicle for the Star Wars: Rise of the Resistance attraction which is being tested in Disneyland. Everything about Galaxy’s Edge sounds incredible to me and my excitement level is through-the-roof! It’s going to be an exciting 6 months or so as new info continue to come out about this amazing new land! 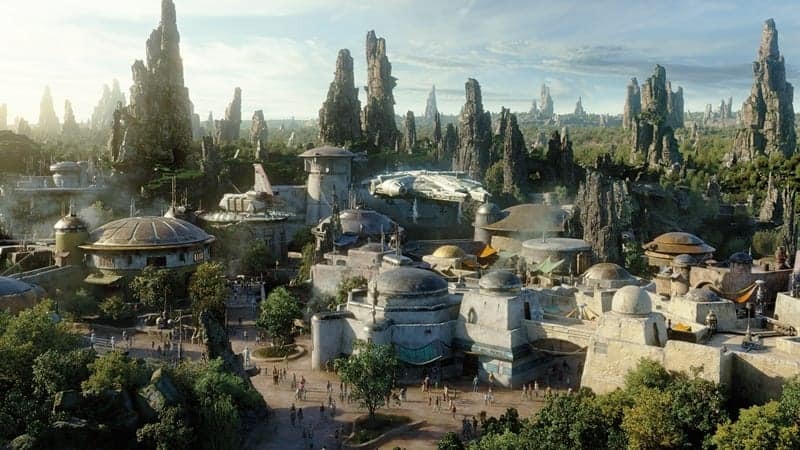 Star Wars Galaxy’s Edge opens in Disneyland in Summer 2019 and in Walt Disney World in Late Fall 2019. 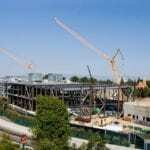 Don’t forget to check out my latest Construction update for Star Wars Galaxy’s Edge where take an incredible in-depth look at progress on all the attractions and buildings including details on the Millennium Falcon currently being built. Are you going to try the blue milk? What is the most impressive detail so far?